I have always loved the movie “Who Framed Roger Rabbit” and always thought Jessica Rabbit was the ‘cat’s pajamas’ haha. 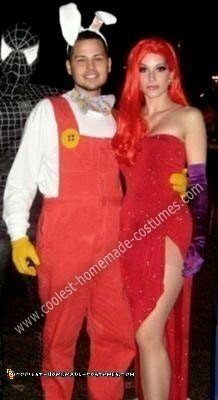 My boyfriend and I therefore chose a Homemade Jessica and Roger Rabbit Couple Costume”. I bought a sequined tube dress on eBay for about $40 after shipping. I then sewed the slit so that it was more open and visible, and so that the dress flowed more when I walked. I then stitched the bustline, cinching it to give it more of a sweetheart shape. I had old white gloves, from my grad year, which I dyed purple using rit dye. The wig I also bought on eBay for about $40. The earrings I borrowed from my mom’s old jewelry box; they’re large, round, and gold, which was just what I needed! I sported some long uber eyelashes and went crazy with purple eyeshadow and red lipstick. Roger Rabbit was constructed in one night in a hotel room. We bought white coveralls, cut out the shape of a one-piece overall and dyed them red. We bought a white long-sleeved T-shirt, as well as costume rabbit ears which came with a tail and bowtie. We dyed a pair of white gloves yellow. We also tried dying the bowtie blue but it didn’t take very well; we cut out yellow circles of fabric and glued them onto the bowtie. Oh, and the buttons on the overalls are fabric too. He wore white shoes. Gotta love my boyfriend for being such a good sport! Homemade costume idea posted by Jessica M.
I love your costume, it’s amazing! It looks more like the real thing than almost all of the dresses available online! They all have straps and just don’t look right! I’m trying to do the same but cannot find the right dress anywhere! Who’d have thought it could be so hard?! Even looked on eBay like you said but there’s nothing. Wondered if you could help? I know your post is old, but if you’re still interested, search for Betty Boop costumes online. There’s one long one that looks much more like Jessica’s dress than any of the “Jessica Rabbit” pre-made costumes. I’m 5’11”, so it was too short on me, but it was very easy to add a large ruffle to the bottom. The dress has the great sweetheart top and the low back that are keystones to Jessica’s classic look. i’m sure it’s too late by now, but also try thrift stores for old evening gowns. i used a red sequined dress for jessica rabbit this year and it looked amazing! for $5.95, you can’t beat that. i spent more on the wig ($25) and shoes ($25) than for the entire dress. happy hunting!